Roxie Lucas plays an unconventional, foul-mouthed and pot-smoking 80-year-old grandmother in the Off-Broadway production of “Let’s Kill Grandma this Christmas.” She has been playing older roles since her tween years. In this Q&A, Lucas discusses her upbringing, experiences on and off Broadway and her plans to stay on the radar. Review Fix: Where did you grow up? Lucas: Well, I was conceived in New Orleans, born in Memphis and raised in Texas. I kind of made a big triangle there but I do call Texas home because that’s where I spent most of my growing up years. Review Fix: How did you find your love of theater and music? Roxie Lucas: I was in the eighth grade and I was doing a production of ‘Oliver’ and I played Mrs. Sowerberry. I’ve been playing old ladies for a long time – since I was 12 years old. It was the first actual book musical I had done. I fell in love right then and there. We were required to fill out our four-year plan for high school. When we had to fill [it out], I put theater for all through high school. That’s where I developed and I had a wonderful, renowned drama teacher, Cecil Pickett, who was very well known in Texas. He taught me so much about theater, technique, acting and directing. I owe a lot to that basic education that I had. Then I went onto the University of Houston and majored in Theater. Review Fix: Do you have a preference – acting or singing? Lucas: I really don’t because even as a singer, I consider myself more of an actress. I’ve been a dancer, singer and a comedienne. Usually that’s where those gifts are used in musical theater and that’s why I’ve done mostly musical theater. I do love doing a play. It’s a rare thing these days to do a play so I love it. I like film and television and I’ve done a little bit of all that. Theater is where I do best I think. 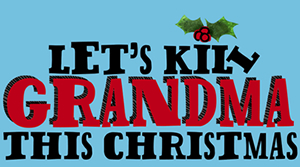 Review Fix: Have you enjoyed working on “Let’s Kill Grandma this Christmas”? Lucas: We’ve been really working hard. It’s hard to rehearse during previews and then have shows at night. It can be taxing but now that we’re open and we’ve been doing the show for a while now, we’re all relaxed. We all get along great. That’s a big thing. Sometimes there’s always one. Wherever you go, whatever you do, whether it’s theater or business, sometimes there’s always just one but not here. We bonded very quickly during rehearsals. The hurricane delayed our rehearsals so we had to get it up and going pretty quick. I have nothing to complain about. Review Fix: What have been your favorite roles? Lucas: I loved playing Sister in “Damn Yankees.” Jerry Lewis was making his Broadway debut so he was in awe of all of us because he never got to show his father that he had made it on Broadway. His dad always said, even though [Lewis] was world famous and in the movies, he said, ‘But Broadway is when you’ve really made it.’ That was one of my most thrilling moments. I loved the show so I really had a blast. I did a show called, “Rainbow Dancing” at The Actors Studio, that I just loved doing. It was a real acting opportunity but it was funny too. Review Fix: Have you had any embarrassing moments on stage? Lucas: I’ve had many whether they were wardrobe malfunctions or falling down but that’s part of our craft. People think it’s just acting, dancing or just singing. One of the things my teacher taught me was that performing is concentration. You have to be aware of what’s going on around you as well as your lines, music, [and] choreography. You have to be ready for anything that comes up. Your mind has to be right there for a light to fall in front of you or a zipper to break. That’s part of our art. I’ve had too many embarrassing moments but you get through them. That’s the magic of live theater. Review Fix: Right before you get on stage, what are you thinking about or doing to prepare? Lucas: For this part in particular, I play an 80 year old woman so I do have to enhance my natural lines and sagging and make it believable that I am older than I am. That’s what gets me into the character when I start putting on the clothes. The externals have always been very important to me because that’s when you start assuming the posture and looking at yourself and seeing what the character looks like and that helps me a lot — being ready for when your time is called to go out on stage. Review Fix: What did you think when you first read the script and your character? Lucas: I was a little shocked because she’s out there. She’s foul mouthed. I thought, ‘Gee, I’ve never done a part quite like this before.’ It took a little bit of time [getting used to] but I’m an actress so you just do it. You just play the part. It didn’t take long to get into it and when I started rehearsing with everybody, [the play] really started coming alive. There’s a lot to say in the play. I think every person in the audience can relate to something or someone in the show. Review Fix: What are your goals for the next few years? Lucas: Right now I’m going through that period of retirement. I probably will continue to work for a long time as long as I’m able but I’m getting to be the age where you have to start thinking about that kind of stuff. I’m going to continue to audition. I really have no plans to go anywhere else. I want to stay here as long as I can. I just feel I’ll continue doing the same that I am now – working, acting, and auditioning — whatever I can do. It’s kind of the only thing I can do so I think that I better stick with it.